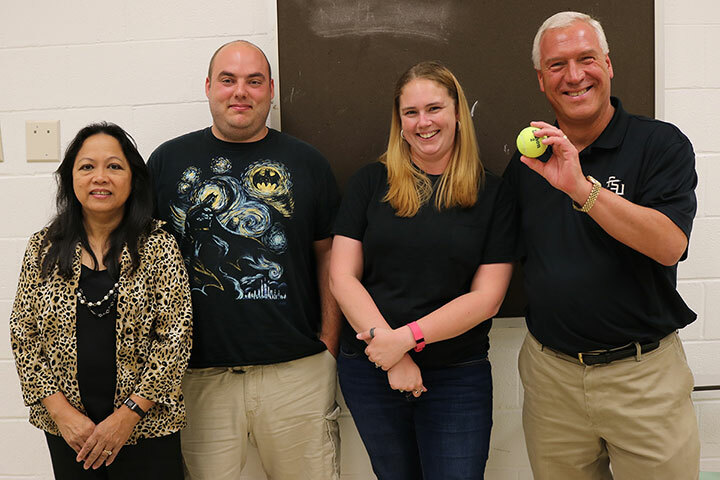 From left to right: Barbara Reyes, the Physics Department's Associate in Teaching and Laboratory Coordinator at FSU; Sean O’Donnell, teacher at Mosley High School; Rachel Morris, teacher at Rutherford High School; Dr. Paul Cottle, Physics Professor at FSU. Florida State University has purchased $40,000 worth of physics lab equipment that will be loaned to Bay County high schools to enhance teaching capabilities. The goal is to raise physics course enrollment levels and instill a passion for science in students. Students from three high schools in Bay County will be able to use the new equipment in their labs. Their teachers worked with Paul Cottle, a physics professor at FSU main campus, in a summer training program to help them practice teaching with the new lab materials. Cottle wants to get high school students excited about physics. The new lab equipment does that by allowing teachers to do more of the fun experiments that students want to participate in and less lecturing. The number of students enrolled in physics classes for the 2016 school year in Bay County has already doubled. The new equipment will allow the teachers to implement evidence-based instructional strategies in their classrooms so their students are able to gain a greater understanding of physics. Each of the three Bay County high schools received seven laptops to use for experiments. Having the laptops opens up a new type of learning that previously wasn’t available. The computers will allow them to measure velocity, speed, height and distance. For instance, students can toss a ball to each other and the computer webcam can track and then map the path of the ball on the screen. From there, the students can do all types of data calculation. “Students will now be able to see data coming in, in real time,” said Cottle. The Future Physicists of Florida induction ceremony Sept. 20 at the FSU Panama City Holley Lecture Hall. The teachers are excited about using the new equipment and are confident that it will boost test scores and maximize student learning potential. The new equipment was delivered in September. Cottle is involved in promoting physics education in many different ways. This week, he participated in The Future Physicists of Florida induction ceremony Sept. 20 at the FSU Panama City Holley Lecture Hall. 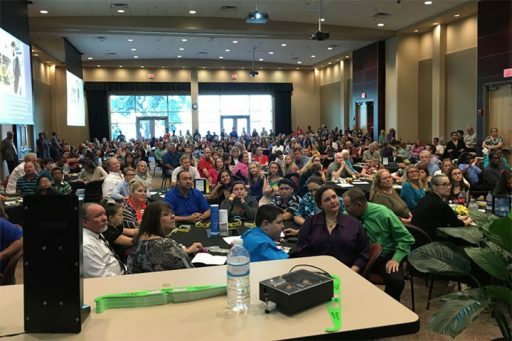 More than 150 students from nine Bay County middle schools were inducted into the program, which identifies middle school students with mathematical and scientific ability and encourages them to persevere in high school math and science courses.